After a sharp thaw and hard re-freeze, reports of stellar conditions all over the Highlands were flooding in. 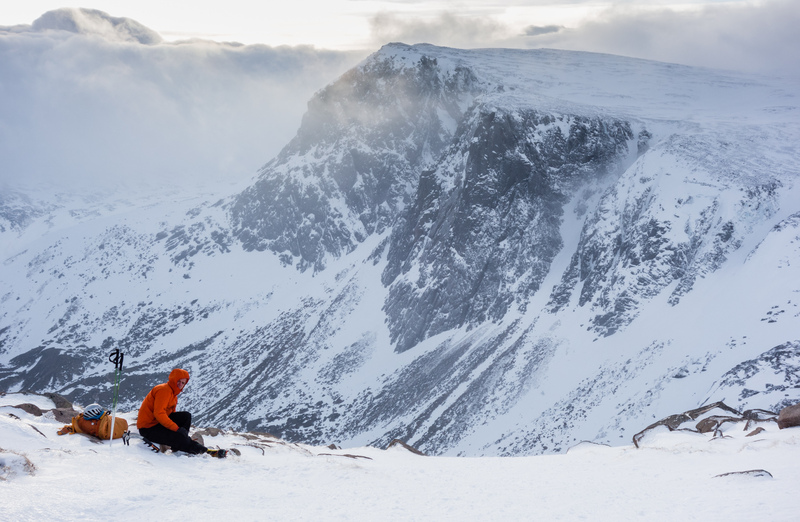 Not wanting to miss out, Andy and I hatched plans for the Loch Avon Basin in the heart of the Cairngorms. 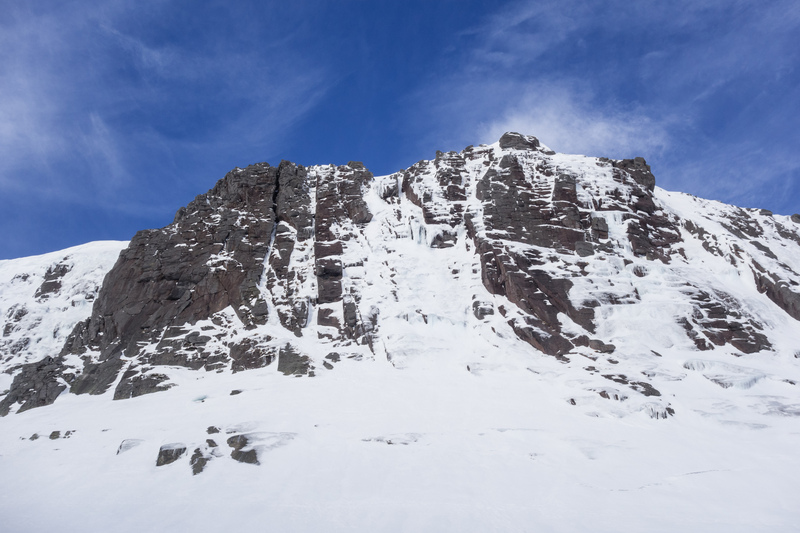 Having never climbed there in winter before, we wanted good walking and climbing conditions combined with a great forecast. With all three apparently in the bag we set off from the ski centre at an optimistic 7 am. Andy dons his crampons in the bitter cold for the descent into the Loch Avon basin. 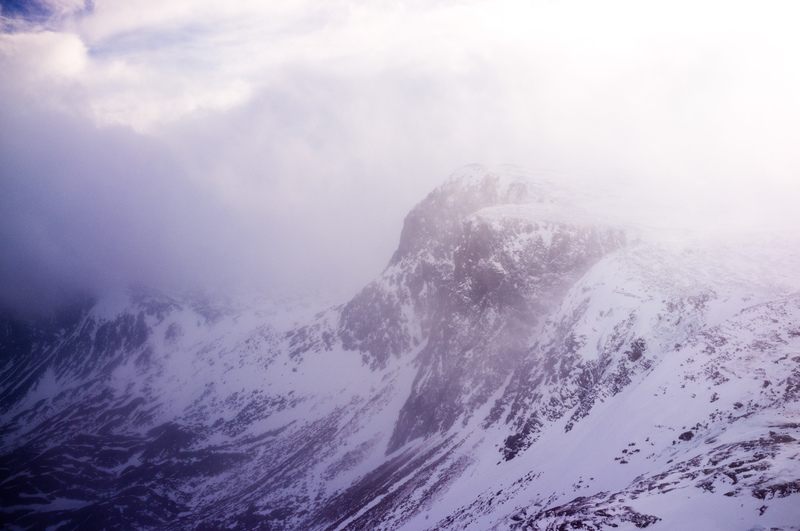 Carn Etchachan and The Shelterstone Crag beyond. Meanwhile on the other side of the basin; Hell’s Lum Crag looking very appealing! Deep Cut Chimney follows the narrow ribbon of ice into the deep slot on the left hand side of the cliff. 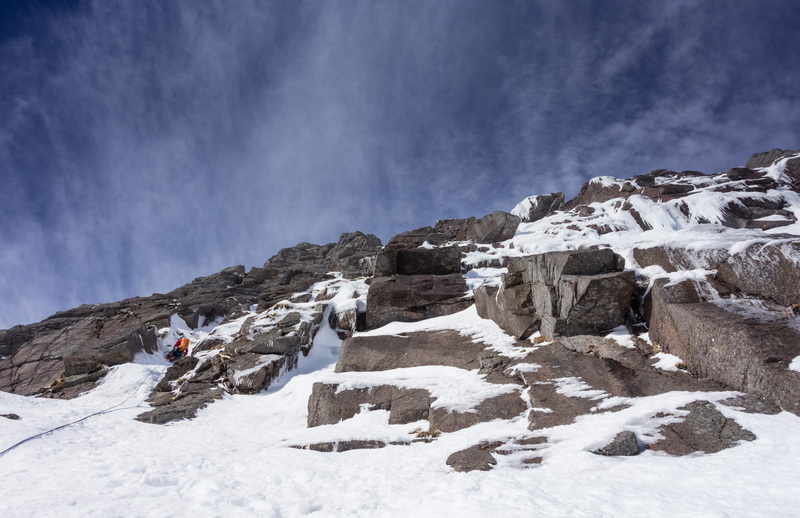 Andy begins 150 m of perfect neve and ice climbing while cloud and spindrift stream off the plateau above in the strong winds. 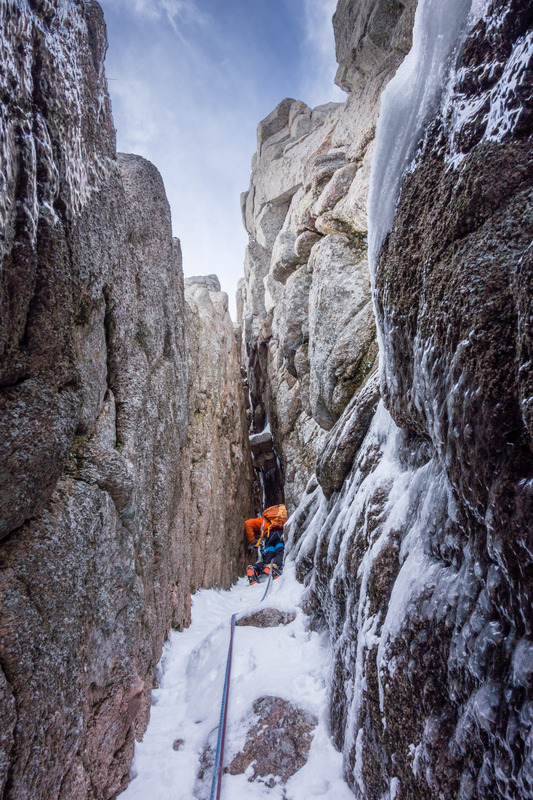 The crux icicle of Salamander (V, 4), which was also climbed that day, can be seen up and to the right. Once established, the route flowed by in a series of wonderful runnels and bulges with ice on the steep bits and neve in between. Rock gear was plentiful in the dry side-walls and the ice took an occasional screw. 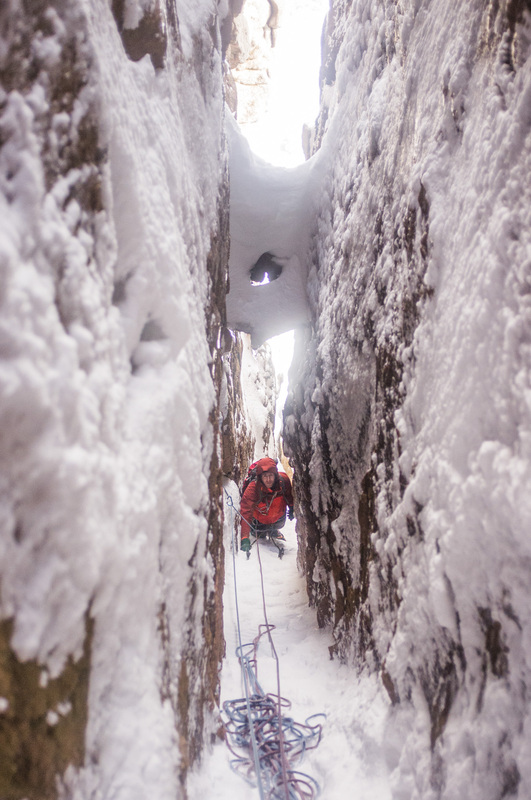 As the chimney narrowed and became even more atmospheric, the climbing just got better and better – we couldn’t imagine wanting to climb this early season under powder! 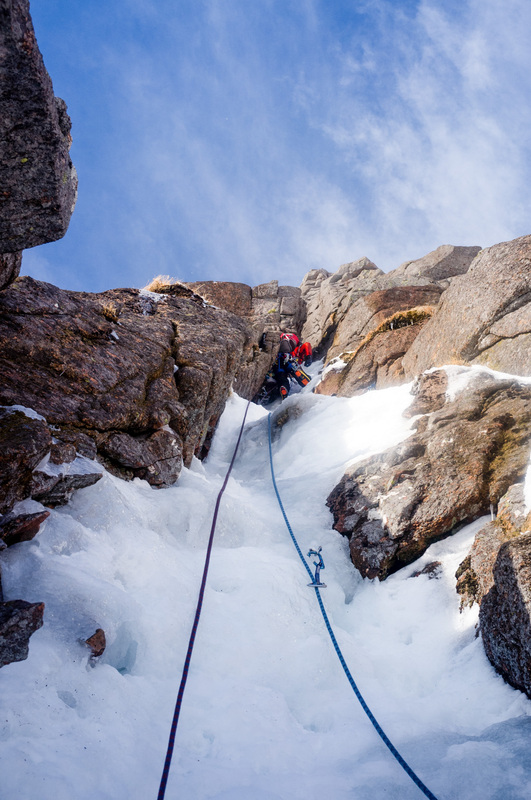 Looking down from the end of the second pitch – a series of steep icy bulges between impending side-walls. Andy about to go subterranean on the third pitch – easier climbing but very atmospheric! 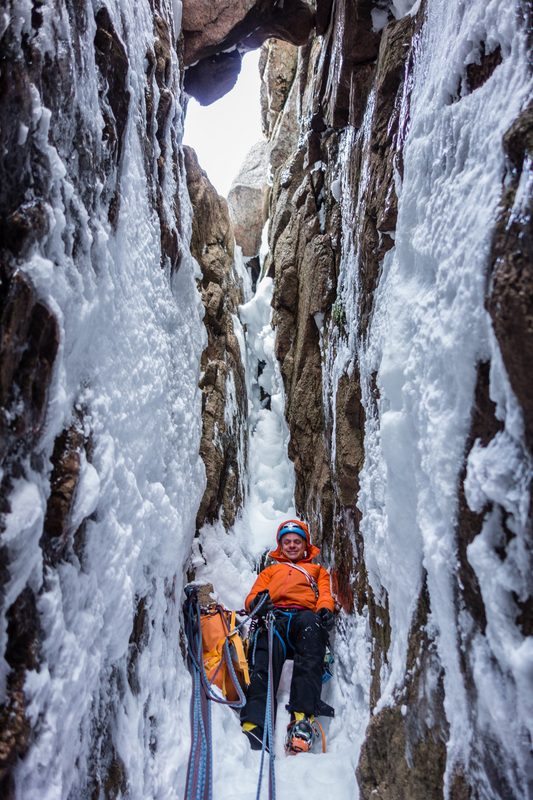 A bizarre perspective – Andy at the very head of the gully at the final belay. Where on earth do we go from here? With daylight above us the only way was up! The final pitch is famous and involves an almost-unique sequence of back-and-footing moves up and out of the slot to reach a pile of wedged boulders. 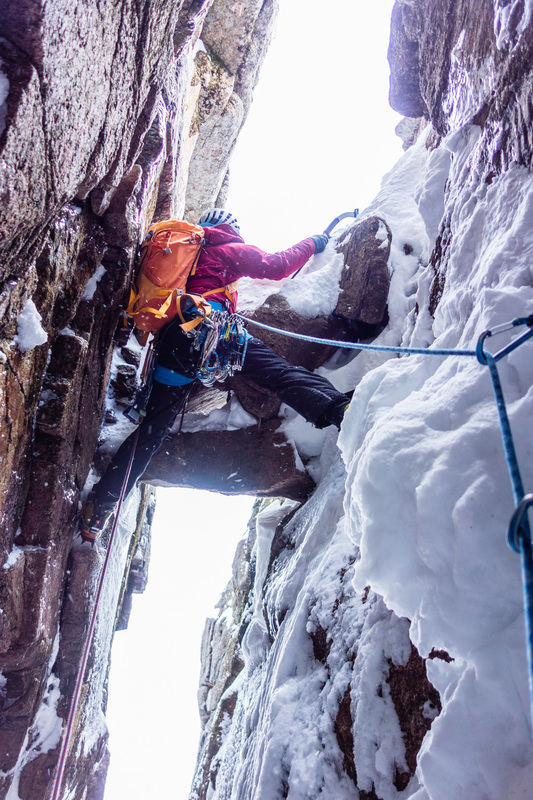 It’s a surprisingly tricky and committing sequence and focus was required after the preceding pitches of neve romping. A foot popping got the adrenaline pumping but Andy was soon disappearing into the light! Seeing the light! 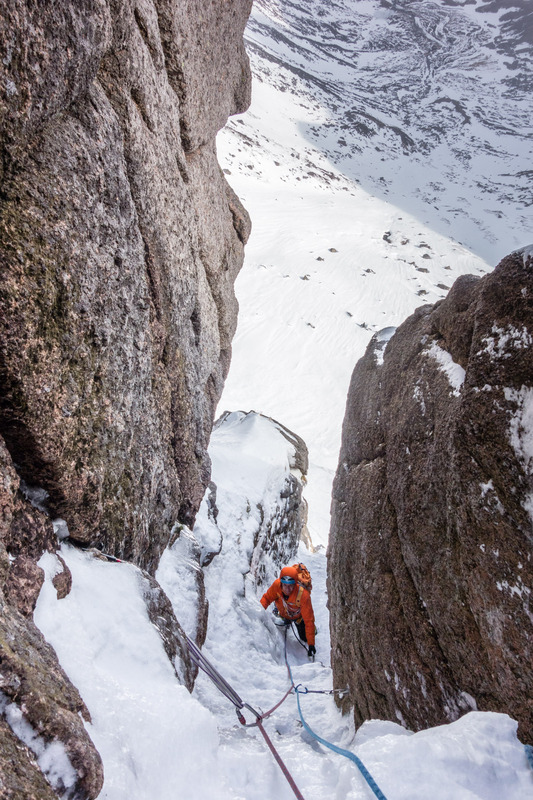 Andy finishing the famous back-and-footing section to exit from the jaws of the chimney – what a finish! So hardly a consolation route and in fact one of the very best winter routes I’ve done, especially in these conditions. With even colder weather on the way it’s set to get even better and I can’t wait to get out there again!